His country superstardom began with “Lucille” in 1977 and progressed through numerous other hits on both the country and pop charts, including several duets with Dottie West, Dolly Parton, Kim Carnes, Sheena Easton, and other singing partners. He is considered a pioneer of mainstream, crossover country, which is as popular with pop fans as country fans. Rogers also had many achievements in acting and business before announcing his retirement from performing in 2015. Kenneth Donald Rogers was born on August 21, 1938, in Houston Texas. His father, Edward, was a carpenter, and his mother, Lucille, was a nurse’s assistant. Kenny had seven brothers and sisters. They grew up in a federal housing project in a poor part of town. Kenny was the first member of his family to graduate from high school, where, in 1956, he formed his first musical group. The group performed doo-wop and rockabilly. The early music career of Rogers, from the late 1950s into the mid-1970s, shifted from one style of music to another. He had a minor local rock’n’roll hit in 1958 titled “That Crazy Feeling” before joining a jazz group called The Bobby Doyle Three. By 1966, he was singing and playing bass in the folk/pop group New Christy Minstrels. Kenny Rogers singing and playing bass with The First Edition on “Just Dropped In (To See What Condition My Condition Was In)” in 1972. Rogers and three other members of that group left to form The First Edition in 1967. Through the mid-1970s, this band charted a series of hits spanning rock, pop, folk, and country music. There was the psychedelic “Just Dropped In (To See What Condition My Condition Was In)”; the sexually charged “Something’s Burning” (written by Mac Davis); and the folkish “Ruby, Don’t Take Your Love to Town” (a controversial song about a disabled Vietnam War veteran, written by Mel Tillis), “Reuben James,” and “But You Know I Love You.” The First Edition broke up in 1976 when Rogers left the group to pursue a solo career. Rogers and The First Edition performing “Ruby, Don’t Take Your Love to Town” in 1972. Soon after leaving The First Edition, Rogers become a big star in his own right. His laid-back but catchy 1977 ballad “Lucille,” from the album Kenny Rogers, reached the top of both the country and pop charts. It was hard to turn on any radio that year without hearing the often-played tune. Many country fans heard Rogers’ gravelly but tender voice for the first time on that wildly popular song. The 1977 album Daytime Friends included the hit title song, as well as “Sweet Music Man” (a Rogers original inspired by the relationship of Waylon Jennings and his wife Jessi Colter). 1978’s Love or Something Like It album had another hit title song. Rogers singing “Lucille” live in 1979. Rogers performing “Lady” live in concert around 1980. Two duets with pop singers scaled up the country and pop charts in the early 1980s. These were “Don’t Fall in Love With a Dreamer” (with Kim Carnes in 1980) and “We’ve Got Tonight” (a Bob Seger song recorded with Sheena Easton and released in 1983). Rogers began his long, successful singing partnership with Dolly Parton in 1983 with “Islands in the Stream” (written by the Gibb brothers, better known as the Bee Gees). Kenny and Dolly charted many more hits together, ranging from “Real Love” in 1985 to “You Can’t Make Old Friends” in 2013. Rogers and Dolly Parton performing “Real Love” in the mid-1980s. From 1971 to 1973, Rogers and The First Edition had a syndicated television music show, originally called Rollin’ on the River and later changed to Rollin’. The band also made a TV drama about the music industry in 1975 titled The Dream Makers. “The Gambler” song, with scenes from the 1980 television movie of the same name. Among Rogers’ other TV appearances is the 1990 movie Christmas in America. That TV movie was only one of Rogers’ many Christmas-related projects. He has also made several Christmas albums and an off-Broadway Christmas stage show. From 1992 to 1995, Rogers hosted a television history series on A&E titled The Real West. He appeared as himself in the 1995 TV movie, Big Dreams and Broken Hearts: The Dottie West Story. He appeared as himself again in the 1997 TV movie, Get to the Heart: The Barbara Mandrell Story. One of Rogers’ successful business ventures has been the restaurant chain Kenny Rogers Roasters, launched in 1991. In 1998, he sold that business and began his own record label, known as Dreamcatcher Entertainment. He has had continued artistic successes since the 1990s. His 1994 album, Timepiece, included a collection of jazz/pop standards, such as “My Funny Valentine, “In the Wee Small Hours of the Morning,” and “You Are So Beautiful.” His 1996 double album, Vote For Love, consisted of a wide variety of songs from different genres. The songs in that collection had been selected by the public through the QVC television shopping channel. 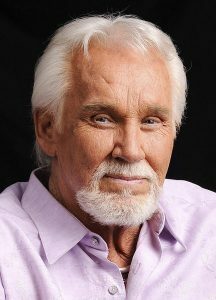 In 2000, Rogers had his first number-one country song in more than 10 years with “Buy Me a Rose.” He followed that up with another country hit in 2006, “I Can’t Unlove You.” In 2011, television viewers enjoyed Kenny Rogers: The First 50 Years, a special that also featured Dolly Parton, Alison Krauss, Tim McGraw, Lionel Richie, Smokey Robinson, Sheena Easton, and many other artists. Rogers and Richie released a duet of “Lady” in 2012. Also in 2012, Rogers released his autobiography, titled Luck or Something Like It: A Memoir (published by William Morrow and Company). In 2013, the Country Music Association (CMA) presented Rogers with the Willie Nelson Lifetime Achievement Award and inducted him into Country Music Hall of Fame. After a music career of almost six decades, during which he sold more than 120 million albums and won numerous CMA, Academy of Country Music, Grammy, American Music, and People’s Choice awards, the 77-year-old Rogers announced his retirement from performing in 2015. His farewell world tour, called “The Gambler’s Last Deal,” was to extend into November 2017.